In this outdoor educational field trip unravel the mysterious ways through which time, water and fire have shaped one of the oldest and largest state parks in Florida. Follow a winding trail through a misty floodplain forest and look for clues of natural and exotic disturbance. Traverse a suspension bridge and view native orchids clinging to canopy branches, before climbing to the top of a 74 foot lookout tower. Employ binoculars to locate and identify native herons, egrets and other wading birds. 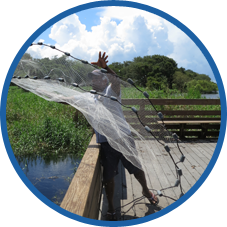 Use a cast net to investigate species of aquatic fish and invertebrates. 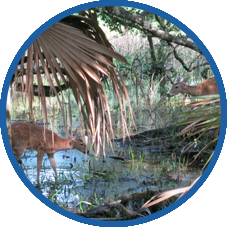 Conduct real water quality tests for evidence of human impact on the Myakka habitats and surrounding watershed.